Miami is the perfect place to spend in the winter (or the summer) to ensure a healthy dose of Vitamin D. This colorful city, spread across various neighborhoods from inland to across the Bay, is the world’s largest collection of Art Deco architecture. With over 15 million visitors to the city in 2016, Miami is one of the most desirable destinations in the country. It’s surrounded by national parks, and for those who want to leave the city, you can hop onboard one of the many cruise ship options — it’s the largest cruise ship port in the world. Bienvenido a Miami! 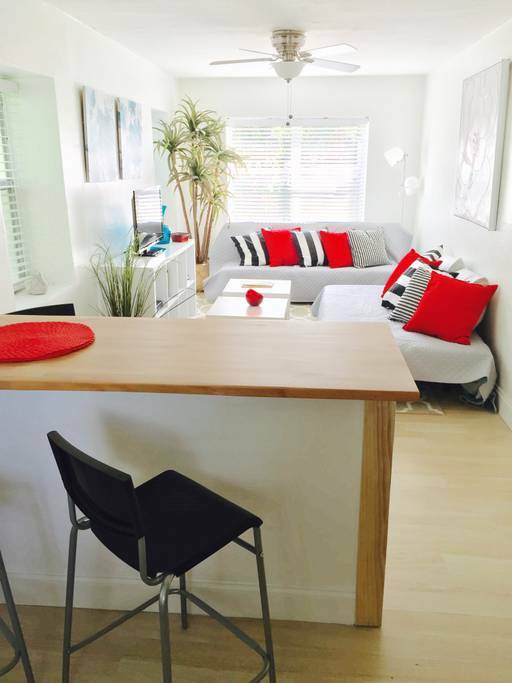 Located in the historic Spring Garden neighborhood, this Airbnb offers a taste of Miami centrally located near the downtown area, and a quick drive across the causeway to Miami Beach. The owners have created a retreat for travelers to find solace in their zen-inspired space. This one-bedroom apartment can sleep up to four guests. There’s plenty of space in this apartment with an amazing backyard that could only be found under the South Florida sun. Rates from $105 per night with one-night minimum stay required. This brand-new studio is perfect for a couple’s retreat. It has all the charm and sophistication one would expect when visiting Miami, specifically the MiMo District. 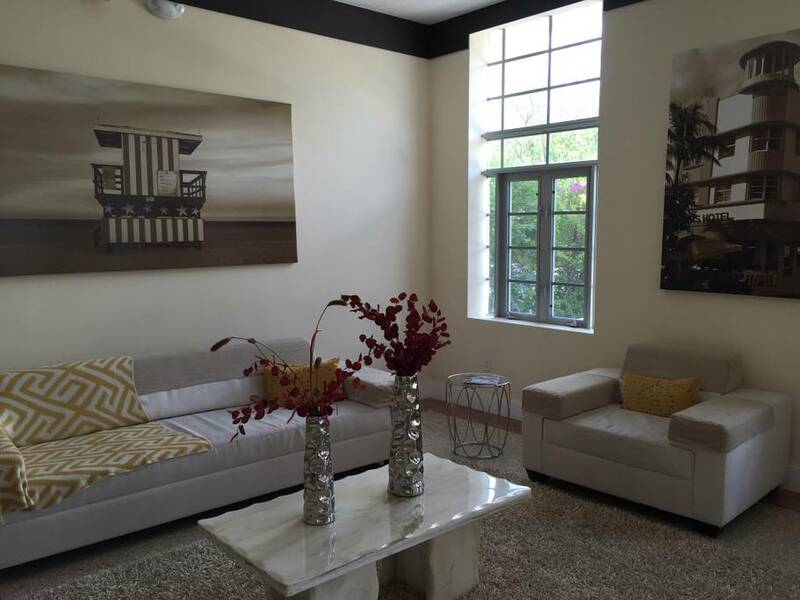 MiMo stands for Miami Modernist, a regional style of architecture that developed in South Florida during the post-war era. It’s housed in a motel-turned-apartment building so it encompasses all the beach-vibes one would expect. 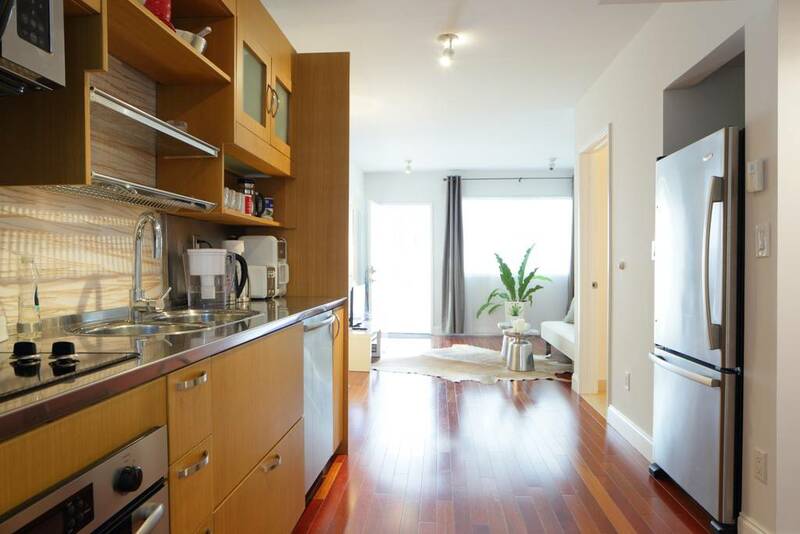 Plus, it’s centrally located to bars and nightlife and a short drive to the beach. Rates from $70 per night with a three-night minimum stay required. Located in a building that epitomizes Miami — an Art Deco building that back dates to 1939 — in the historic Mid-Beach neighborhood. It comes with a pool for all the residents and, when you want to wander out to the beach and beyond, it’s only a short walk to the water and boardwalk. The New York Post calls Mid-Beach Miami’s haute new spot, and if the number of museums, restaurants, bars and clubs is any indication, we believe them. Rates from $77 per night with three-night minimum stay required. This apartment, located on the 16th floor, faces the ocean and gives way to the amazing crystal-clear water below. What’s more, manatees, rays, schools of fish and dolphins can regularly be seen from the balcony. When you want to travel down to the beach below, there’s no need to cross the street; just take the elevator down and walk out to the white-sand beaches of Miami Beach. Rates from $150 per night with one-night minimum stay. You can’t go to Miami’s famed South Beach area without hitching a ride down Ocean Drive. 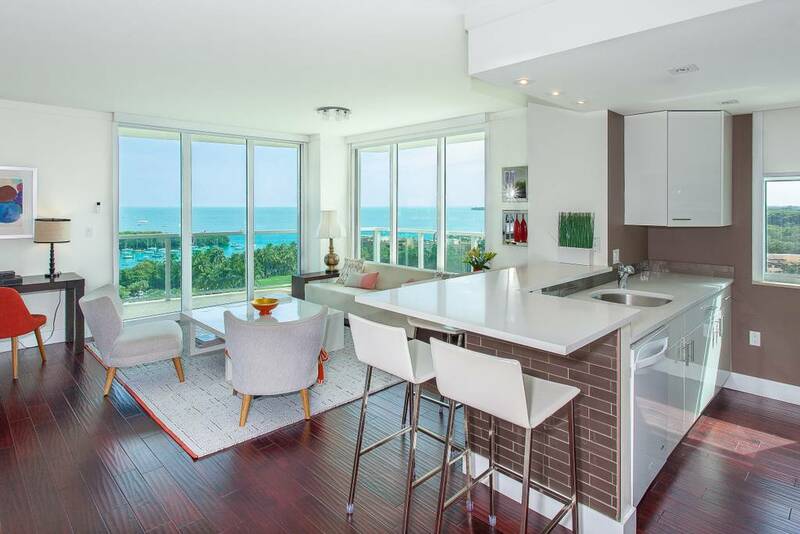 This apartment is located in the heart of South Beach and it’s every Miami visitors dream — two bedrooms in a beautifully decorated apartment, an Art Deco building and a beautifully landscaped yard for when you want to catch the ocean breeze. 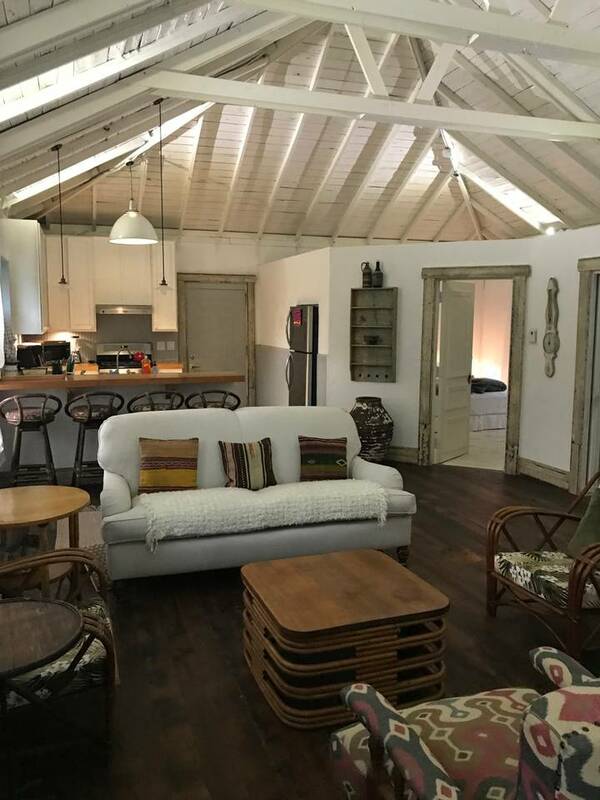 This is the perfect retreat for a group of friends or couples getting together for a party weekend. Rates from $169 per night with three-night minimum stay. 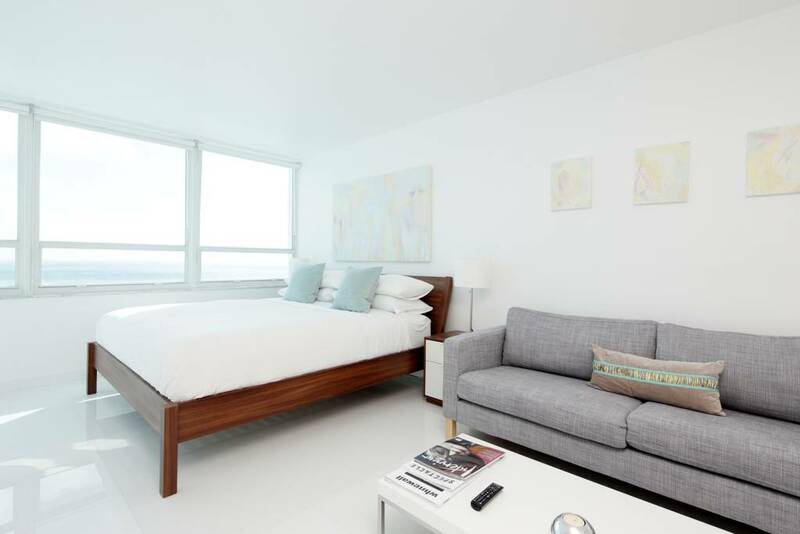 This two-bedroom apartment is the perfect Miami pad. Think: wrap-around balcony, elegantly designed interior, close to restaurant and bars and unrivaled views. The apartment has been remodeled recently and has all the necessities for those getting away for the weekend or making this Airbnb their temporary home-away-from-home. One evening of watching the sunsets from the balcony and you may never want to leave. You’ve been warned. Rates from $279 with the minimum stay varying per stay. 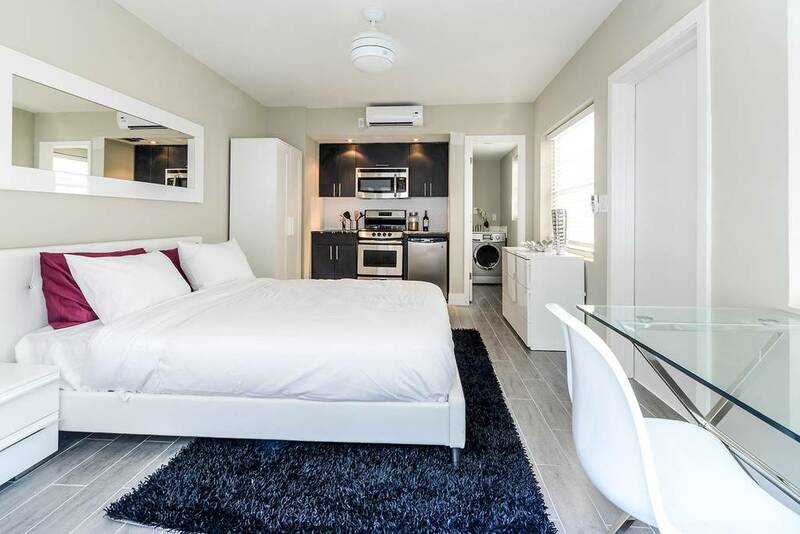 This bungalow, which is nearly a century old, is located in the Wynwood neighborhood of Miami, a trendy area best known for its colorful murals and surrounding art galleries. It’s great for a small family or a couples getaway and is located on a private, gated piece of property that guarantees privacy. The vaulted pine ceilings and open layout give this an especially beachy feel and immediately transports anyone to the tropics. Rates from $400 with a three-night minimum stay. This minimally decorated abode is sure to leave all its guests in awe. The 3,000 square-foot house on Biscayne Island will make for a stunning Instagram backdrop and the pristine house can fit up to 10 guests, so there’s plenty of room for everyone. And the best part? There’s a pool in the backyard surrounded by the house’s two terraces. This showstopper is sure to make for the perfect trip to Miami. Rates from $900 with three-night minimum stay required. There are plenty of ways to maximize your stay with points and miles. If you’ve never used Airbnb before, sign up through TPG to get $40 off your first booking — and the gravy train doesn’t stop there. Book through the Delta portal and earn 1 SkyMile for every dollar spent on your stay, and make sure to charge the purchase to a travel rewards card to rack up extra points. Using a card like the Chase Sapphire Preferred will get you 2x points on all travel purchases while the Chase Sapphire Reserve will get you 3x points on an Airbnb stay. When you combine the two, you’re effectively double-dipping with your points earning. Prices are accurate as of publication date but are subject to change. All photos courtesy of Airbnb; featured image by Jeffrey Greenberg / Getty Images. What are some of your favorite things to do in Miami? Sound off, below.